Other then 1/2" Pink, everything is in stock, and the pink will be arriving in a week or so. Any order placed by 10am Eastern time Mon-Fri will ship that same day. If you have any questions just let us know. The best way to reach us is on the contact form on the website, but we'll keep an eye out here as well. Damn it, Rich! Do you know how much space your t-molding takes up in my workshop/dining room?! And now, you go and add MORE colours I need to buy??! Today, February 1st, 2016 is our 16th Birthday! 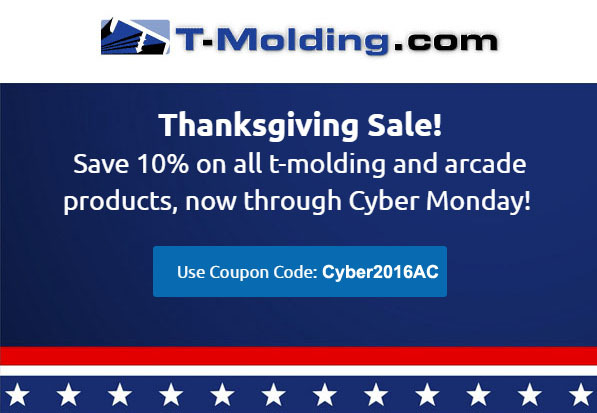 We're celebrating with a 16% off sale for all t-molding orders of $50 or more from now until 12pm Eastern tomorrow. No coupon code needed - it's automatically added the shopping cart when you pass the $50 mark. The sale will run until 12pm Eastern time on Tuesday, 2/2. Come join us for our birthday! Thank you Rick! I just posted about a 16% sale we're running today, sounds like a great time for you to stock up and fill any room you have left! We've added Pay By Amazon, so you can now easily checkout using your saved Amazon shipping address and credit card. Thanks, Rich. Great product, great prices, great service! Ask your UPS driver (or leave a note), there's a form you can sign to allow them to leave packages on your doorstep. I've gone even further than this with them on a number of occasions. Sadly, I've tried online and even called UPS, and they've notified me that the shipment cannot be left "signature not required", regardless of the circumstances. I've had the same problems (and more) with them, they are total ---daisies--- and I avoid them at all costs. Shipping companies need to understand that the people being delivered to pay for the shipping cost and are their customers, not the companies doing the actual shipping.